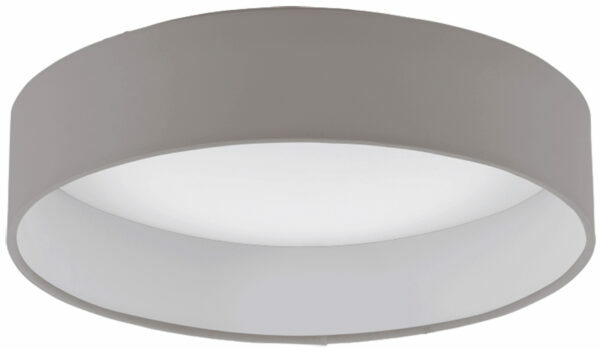 This Palomaro 11w LED flush mount taupe fabric circle ceiling light features a 32cm diameter taupe fabric dish fitted directly to the ceiling; containing warm white LED’s and white domed polycrabonate shade for a softer light. The replaceable LED module produces 850 lumens and can be ceiling or wall mounted. A modern, minimalist LED light that is energy efficient and produces around the same illumination as an old-fashioned 100w lamp bulb that looks great in any environment and is ideal lighting for any room with a low ceiling. There is a larger matching fitting in the Palomaro lighting range and also available in cream and dark grey; please see below. This modern light is made by Eglo International who have been around since 1969 and is one of the largest European manufacturers, with a huge range of traditional and contemporary designs like the Palomaro 11w LED flush mount taupe fabric circle ceiling light you see here.